It’s a small Chateau in Kunice just a few km away form Prague towards Brno. 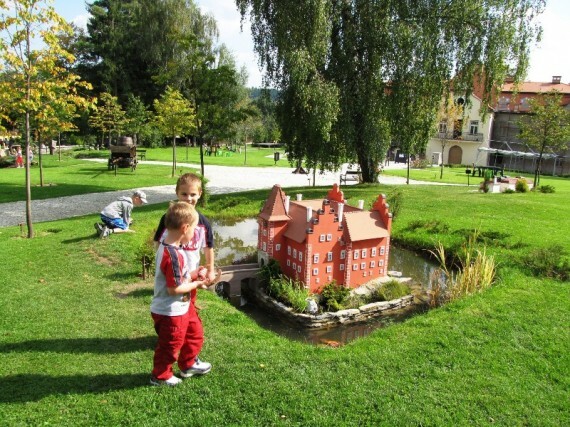 The owners decided to change their gardens into fairy tale land for kids with fairy tale creatures and miniatures of Czech castles. Part of the whole complex is a Mini Zoo, a large playground, tennis courts and indoor table tennis. We spent perfect Sunday afternoon here. At the moment the Chateau is being reconstructed into a hotel with a restaurant and it will be opened in July, 2011. 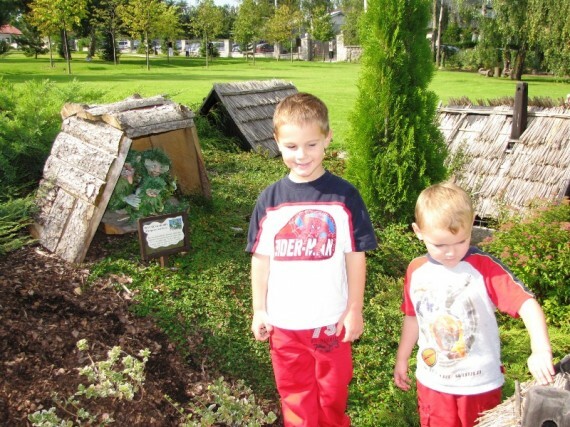 Together with the gardens it belongs to a Czech family who invested their own money to create this fairy land for kids. It may have something to do with the fact that the owners have 3 small children, the youngest one is just 6 months old. As the owner says he has produced his own customers. The first expression that comes to mind mind when recalling the experience is neat and clean. Everything is so well thought through and is detailed and cared for with love. When we arrived we were quite hungry and for some reason I thought there must be a restaurant within the whole complex. Not yet. You can order pizza, sausages and ice-cream at the reception and that’s about it. The restaurant should be opened in the reconstructed Chateau when it opens for business, scheduled for 1.6.2011. They already have the menu on the web so it looks like its happening. For now you have to stick to pizza or visit one of the restaurants nearby. We settled for the pizza and it wasn’t bad at all. 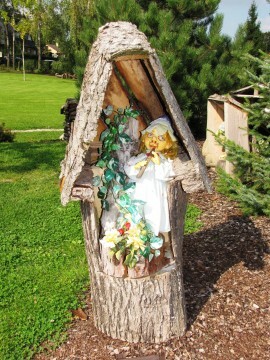 To enter the Fairy Tale Garden you have to purchase a ticket at the reception of the sport clubs. 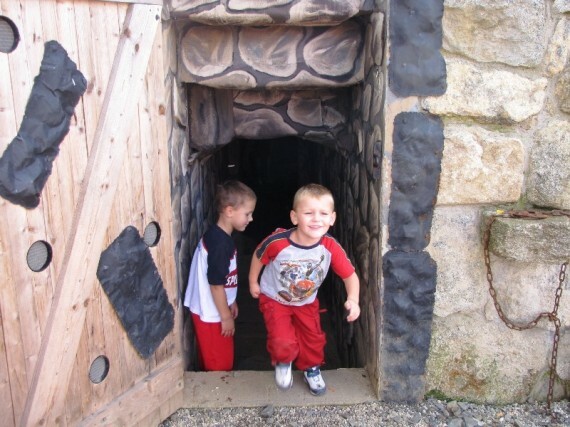 Here you will be given a password you have to tell at the gate after you ring the bell. Now this could be quite funny exercises for foreigners! Just the garden itself will take you at least an hour to walk through. 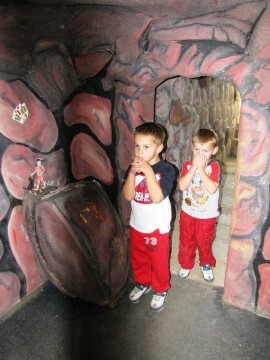 The biggest attraction was the Baba Jaga house and visit into the Devils Dungeon. 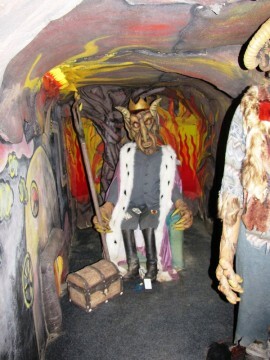 It’s actually very amusing to walk in the cave with 2 life size devils with red, blinking eyes and mysterious music in the air. My boys were mesmerised and stood there respectfully. They kept going inside and out and could not leave. The Devil cave was just too tempting. Eventually my Nikki came up with an idea to throw stones at the devil and grouped 5 kids together with him for the attack. So I had to drag them out and move to another attraction. From there we went to play tennis for an hour together with the boys. We brought our own rackets but you can borrow everything right on the spot. If you prefer table tennis there is a separate room with a table and again you can get all the gear at the reception. For small fee of course. Latest thing they have is an indoor golf training field. The weather was gorgeous and our last stop was the big playground where me and hubby lay on the grass while boys ran around with other kids. Even here at the playground there is a small table where you can bring a picnic. If you wish to organize a bonfire, upon request you can have it in the gardens. 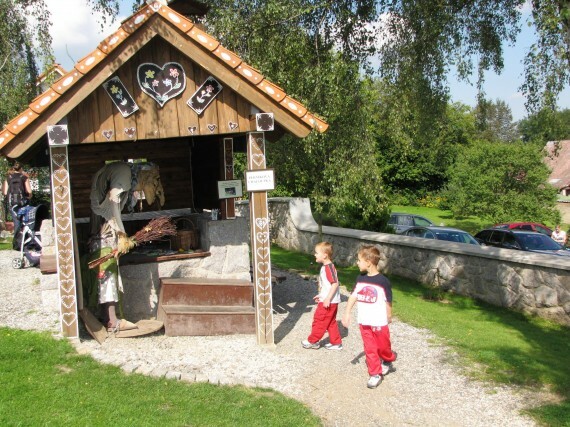 I am very much tempted to go there in the autumn months and do the typical Czech sausage roasting on an open fire. Oh, I almost forgot Mini Zoo pictures. 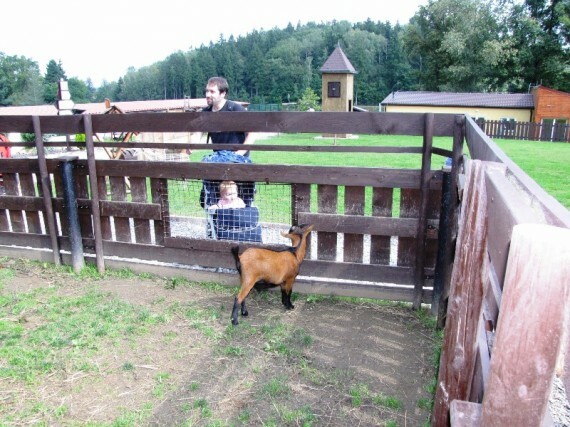 It isn’t big, there are few goats, rabbits and pigeons but all together within the whole complex it is a nice touch. OPEN: 08:00-21:00 every day. Between November and March some of the displays may be under construction. DIRECTIONS: By Car: Berchtold Castle is located in the village Kunice in the Central region about 15.5km from Prague on the Brno D1, take the Vsechromy Exit 15, Great Popovice turn and turn towards Vsechromy, Strančice. 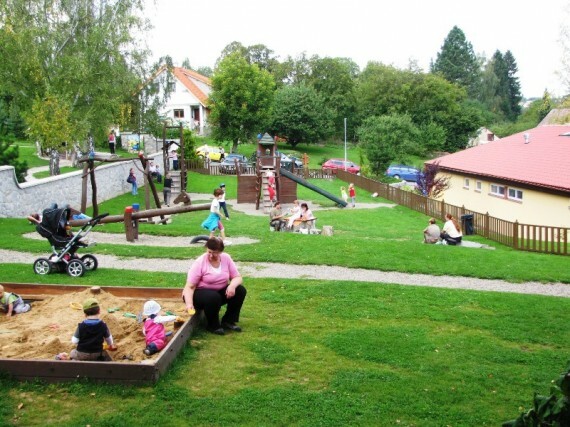 After entering the village Strančice turn right and turn toward the alley of Cherry Kunice, which continue along the main road about 1.5 km and turn left at the sloping wall of the park. By train and bus: From Prague - Main Station (or Benešov) runs every 60 minutes by train, which stops in Strančice. On this route follows the bus line 461, which goes to Kunice. 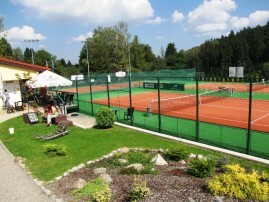 Get off at bus stop Vidovice, which is located about 400 m from the sports centre (50 m from the park).